This next series of posts will be on Investing. But before you can begin to invest, you need to start saving money. After all, you can’t invest money if you don’t have any saved up. Saving is the key to wealth: the more you save and invest, the sooner you can achieve your financial goals. It’s not just about how much income you make; it’s about how much money you keep. If you are spending everything that you earn, you have zero net worth and are adding nothing to your wealth. If you have high interest debts like credit card bills, you have negative net worth. You need to stop being a chump and pay off your high interest debt before you consider investing. Credit card interest rates can be as high as 29% or more. There is no guaranteed investment that can offer you this type of return. These high interest debts need to be dealt with ASAP. Otherwise, the more time that passes, the more negative wealth you are accumulating. To find available money to invest, you can either earn more or spend less; obviously you should do both. The earlier you start saving and investing, the sooner you will reach financial independence. When you retire, your spending money will come from these investments. The wife and I have been saving an incredible amount of money over the last few months. I’ve personally increased my savings rate to over 40% of my take home pay, with most of that amount going to investment accounts. My wife has increased her savings rate to over 60% of her take home pay, with most of it also going into her investment accounts. These higher savings rates didn’t just happen overnight. We’ve made realistic goals and slowly increased our savings rate target over time. We’re not stopping at these savings rates and are slowly pushing for more savings and more investment contributions. For most people (myself included), it can be extremely difficult to start acquiring the habit of saving. However, if you keep waiting until you have extra money to invest, you will wait forever. You will miss out on the power of compound interest. Leandra starts investing early, contributing $2,000 a year starting at age 25. Kevin starts investing much later at age 40, but contributes $5,000 per year. Even though Kevin contributes much more than Leandra, his total net worth at age 60 still comes up short when compared to Leandra. This example assumes an 8% return. If you put off investing until later, you will miss out on putting money into tax advantaged accounts such as 401(k)s and Roth IRAs. Tax advantaged accounts allow your money to grow without portions being removed every year to pay for taxes. Once the fiscal year passes for your tax-advantaged accounts, there is no way to go back and put money in later. You can’t afford to wait until later to think about retirement. If you’re looking for a starting point, I suggest paying yourself first and saving 10% to 20% of everything you make. This is a reasonable amount that should not set back your normal spending routine too drastically. You can’t work forever. You will need to be able to support yourself and your family when you stop working in retirement. If saving 10% of your take home pay is going to be a problem, you are in a financial emergency. If you are living on a paycheck-to-paycheck mentality, you need to make some drastic lifestyle changes now. Your financial future depends on it. A job loss in the family or a new medical condition may be all that needs to happen to put you into bankruptcy. After saving enough for an emergency fund, you can ramp up your investment contributions. 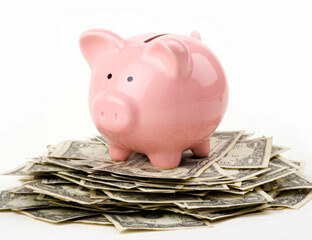 Once you feel comfortable with a savings rate of 10% of your take home pay, you can slowly increase your savings rate. Even a 1% increase in your savings rate every few months can make a significant difference over time. Tracking where your money is going will allow you find out areas where wasteful spending can be converted into meaningful saving. I recommend using mint.com, clearcheckbook.com and pocketmoney to track where your money is going. Tracking where your money is going will also give you the information you need to determine your living costs when you are financially independent. Not properly budgeting or tracking spending habits could leave you with insufficient savings and investments for retirement. And not having enough money is the reason most people work past their 60s or live a life dependent on government handouts. Sure the government won’t let you starve, but it won’t be their goal to make your retirement as comfortable as possible. I recommend using online banks such as Capital One 360, Ally or American Express Savings. These online banks have much higher interest rates than traditional banks, have no minimum deposits, no maintenance fees, no account minimums to keep, and are FDIC insured to the maximum allowed by law. These online banks also provide 24/7 customer service, ATM access, and can link with their online checking accounts so your money is easily accessible. The wife and I keep most of our savings with Capital One 360. The very best reason to have an online bank account is that these accounts make it extremely easy to open multiple savings accounts for multiple savings goals. The general rule of thumb for your retirement fund is that you will need to set aside an amount equal to 25 times the amount you plan to withdraw each year. To accumulate this amount of money, interest from your bank savings accounts won’t do. Investing in the stock market can provide you with the much higher returns you’ll need to accumulate in order to retire. This is the Dow Jones Industrial Average. The market has always gone up with time. 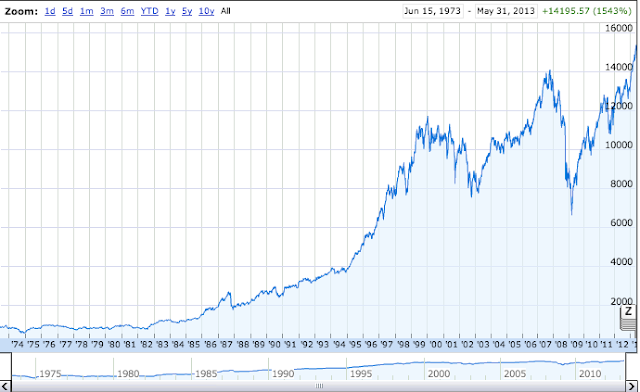 In the next post here, I discuss stocks and bonds.